MADE TO ORDER ... ALL of my pens come with the option of being crafted into a rollerball pen, rather than a dip pen, which will allow you to change the 'INK CARTRIDGE' when ink runs out. 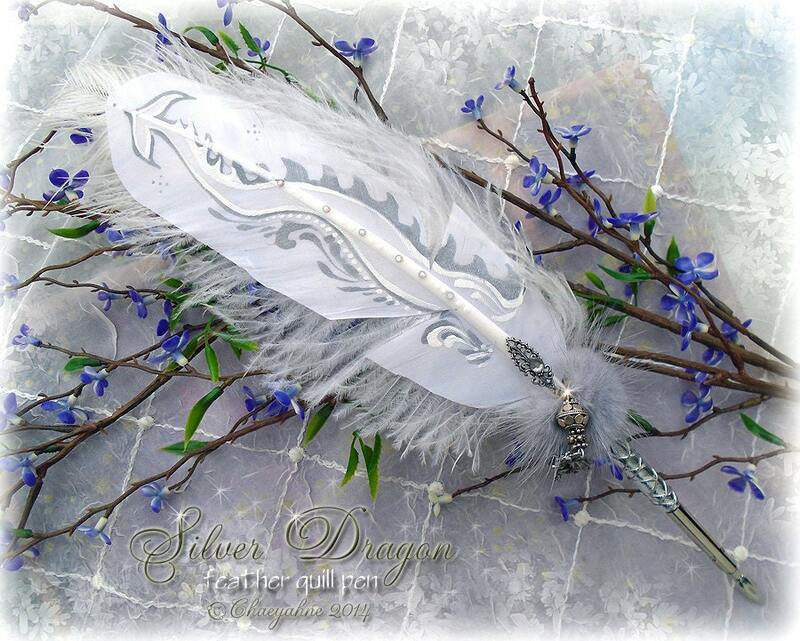 NOTE: This pen can be purchased as either the Silver Dragon Quill Pen alone, or with an added Writing Set. The writing set includes a bottle of my exclusive black ink, plus 3 different & varying writing points (nibs). 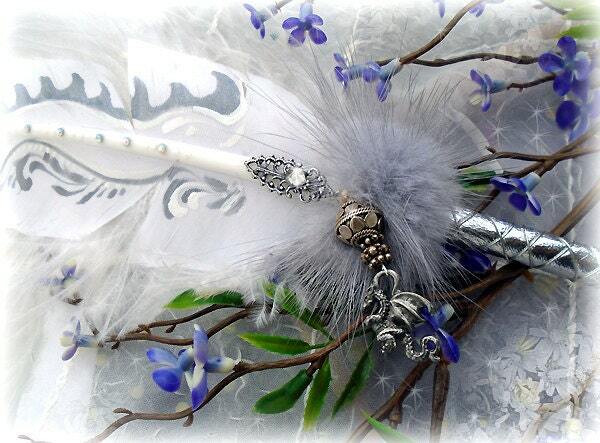 This pen was created from a Snow White Turkey Quill with added crystal faux gem accents & white ostrich plume backing. The whimsical Dragon’s Tail is hand painted in silver & white running the entire length of the main quill, and the pens writing shaft is wrapped in sparkly silver leather, and then cross-hatched with fine silver wire. Accents: Silver-plated ferrule which allows for the inter-change of nibs, 1 vintage writing nib, silver dragon totem, sterling silver beads & spacers, 2 vintage silver filigree accents (one on the reverse) with a beautiful reclaimed silver mink base wrap. This pen comes tissue wrapped, and complete with our CSD studio certificate of authenticity.